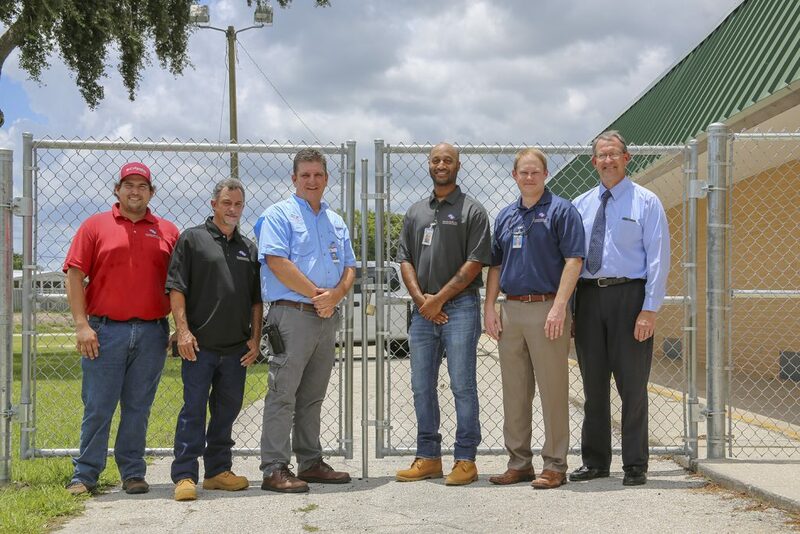 Wharton-Smith Completes District-Wide Security Updates on 84 School Facilities in Brevard County | Wharton Smith, Inc.
Titusville, FL – On July 31, 2018, staff from Brevard Public Schools, School Board Representatives, the community and integral project team members joined together to mark the completion of the District-Wide Security Projects for Brevard Public Schools at Andrew Jackson Middle School in Titusville. Principal Tina Susin kicked off the ceremony by locking the last gate for the district with a golden padlock presented by Wharton-Smith, the project’s Design-Builder. This exciting event symbolized the completion of a complex undertaking by Brevard Public Schools to secure 88 school facilities throughout the District with Wharton-Smith working on 84 of those facilities by creating a single point of access through the installation of perimeter fencing, door-lock systems, cameras, and miscellaneous sitework due to changes in traffic patterns for students entering and leaving the secured areas during school hours. “We are fortunate to have been a part of keeping the students, staff and classrooms safe and secure in Brevard County,” said Johnathan Wilkes, Sr. Project Manager, “Projects such as this that improve the safety of our communities is at the core of why Wharton-Smith is in business,” he added.